This PDF 1.4 document has been generated by Adobe InDesign CC 13.0 (Macintosh) / Adobe PDF Library 15.0, and has been sent on pdf-archive.com on 07/03/2018 at 14:18, from IP address 179.183.x.x. The current document download page has been viewed 519 times. File size: 9.9 MB (23 pages). 5 Introduction: What to eat? levels of consumption are not sustainable. have a very significant impact. humans and the planet as a whole. need to transform to meet these challenges. same question: What to eat? wellbeing but also on Earth itself. can also make us very sick. threatening to our survival on Earth. climate, and upon the environment in general. the degradation of many rivers, lakes, and coastal seas. sick. But it is also making humans sick. 2. IPCC 2014: Smith, P., et al. 2014. Agriculture, Forestry and Other Land-Use (AFOLU). 3. Bajželj, B., et al. 2014. Importance of food-demand management for climate mitigation. 4. IPCC 2014: Smith, P., et al. 2014. Agriculture, Forestry and Other Land-Use (AFOLU). Environmental Research Letters, 7: 044009.
exceeding planetary boundaries. Ecology and Society, 22: 8.
implications. Nature Reviews Endocrinology, 9: 13. In this report, we try to answer the question of What to eat? while improving the wellbeing of humans, now and into the future. ecosystems that make human life on Earth possible. dairy systems on the environment. set in motion by trends towards increasingly meat-heavy diets. on which our children can enjoy healthy lives. security while protecting the climate and biodiversity. reference year for the Greenpeace goal. that the best approach is a holistic one. absolute production and consumption volumes. poultry and pork are big consumers. problems usually require holistic solutions. 2. Oxfam America 2015. Lives on the Line - the human cost of cheap chicken. 3. IATP et al. 2017. The rise of big meat. Brazil’s extractive industry. point of retail sale).Data from FAOSTAT, 2018. Dairy cows are also a major consumer of feed crops. to feed animals instead of feeding people directly. Conversion of feed to animal food is largely inefficient. because of associated bacteria and other pathogens. Perspective, by T. Hemme and J. Otte. Rome. also a very important factor that needs to be considered. 8. FAO: Poultry and poultry products - risks for human health. the Royal Society B: Biological Sciences, 365: 2793.
those, 66 billion are chicken. seats available for GHGs to limit global warming to 1.5ºC by 2050.
bus and probably lead to overflowing and a dangerous journey ahead. 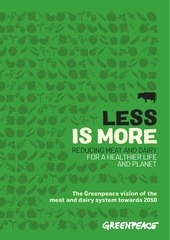 from meat and dairy production. health due to improved diet, and a much better prospect for protecting nature. Food system emissions in this example do not include land-use change. well below 2 °C. Nature, 534: 631-639. 2. Bajželj, B., et al. 2014. Importance of food-demand management for climate mitigation. Nature Climate Change, 4: 924-929.
meeting stringent climate change targets. Climatic Change, 124: 79-91.
because the impact of different greenhouse gases on the atmosphere is not the same. as CO2. All scenarios are expressed in terms of billions of tonnes of global annual CO2equivalent emissions per year (Gt CO2e yr-1). 6. Bajželj, B., et al. 2014. Importance of food-demand management for climate mitigation. Nature Climate Change, 4: 924-929. This analysis is for limits between 1.5º and 2º C.
8. IPCC 2014: Smith, P., et al. 2014. Agriculture, Forestry and Other Land-Use (AFOLU). 9. Bajželj, B., et al. 2014. Importance of food-demand management for climate mitigation. under different livestock futures. Global Environmental Change, 47: 1-12.
on global food system sustainability. Journal of The Royal Society Interface, 12.
gases from agricultural production. Global Environmental Change, 20: 451-462. 7. Stehfest, E.et al. 2009. Climate benefits of changing diet. Climatic Change, 95: 83–102. people hungry and close to 2 billion overweight. diet model from Roos et al (2017)). people at its heart. Greenpeace Research Laboratories Technical Report). agriculture. Nature Communications, 8: 1290.
al. 2014. Importance of food-demand management for climate mitigation. Nature Climate Change, 4: 924-929; Röös, E., et al. 2017. Greedy or needy? futures. Global Environmental Change, 47: 1-12 and IPCC 2014 (Smith, P., et al. zones for humanity and biodiversity. management for climate mitigation. Nature Climate Change, 4: 924-929.
for fodder or pasture, respectively). be released into the atmosphere. sequestration. This estimates are a broad approximation from previously published values. raw unprocessed products at the point of retail sale). capita per week (a glass of milk is roughly 200 grams). sections of societies, even in developing countries. take the lead in moving towards more plant-rich diets. and among different sections of our societies. goal towards 2030 and 2050. 7. Herrero, M., et al. 2016. 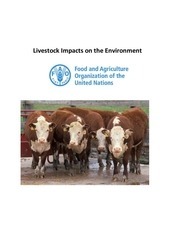 Greenhouse gas mitigation potentials in the livestock sector. Nature Climate Change, 6: 452–461. 1. Bajželj, B., et al. 2014. Importance of food-demand management for climate mitigation. 3. Rockström, J., et al. 2009. A safe operating space for humanity. Nature, 461: 472-475.
changing planet. Science, 347: 6223.
acidification 8) stratospheric ozone depletion and 9) atmospheric aerosol loading. and phosphorus pollution), and 4) climate change. by our current food system. planet. Science, 347: 6223. Graphic © theguardian.com (2015). This file has been shared by a user of PDF Archive. Document ID: 00742406.